KetoVie Peptide 4:1 is the first ketogenic medical food for people with protein sensitivity or digestive issues. It’s better for people who have problems digesting regular ketogenic formulas because instead of intact proteins, Ketovie Peptide 4:1 has peptides. Peptides are chains of amino acids strung together like beads on a necklace. Connect the right peptides together, and you make a protein — which many people can’t digest. Break the protein down into peptides, and more people can digest it. The smaller the peptide chain, the easier it is to absorb, and smaller chains of peptides are less likely to cause allergic reactions too. Who Needs a Peptide Formula? Some people can’t digest intact proteins because they don’t have enough digestive fluids. Other people need a peptide formula because they are being fed directly into their small intestine instead of their stomach — common when people start the keto diet while hospitalized. Before KetoVie Peptide 4:1 became available, people who needed a peptide formula had to mix up several ingredients along with extra vitamins themselves. Some people couldn’t access ketogenic diet therapy at all. 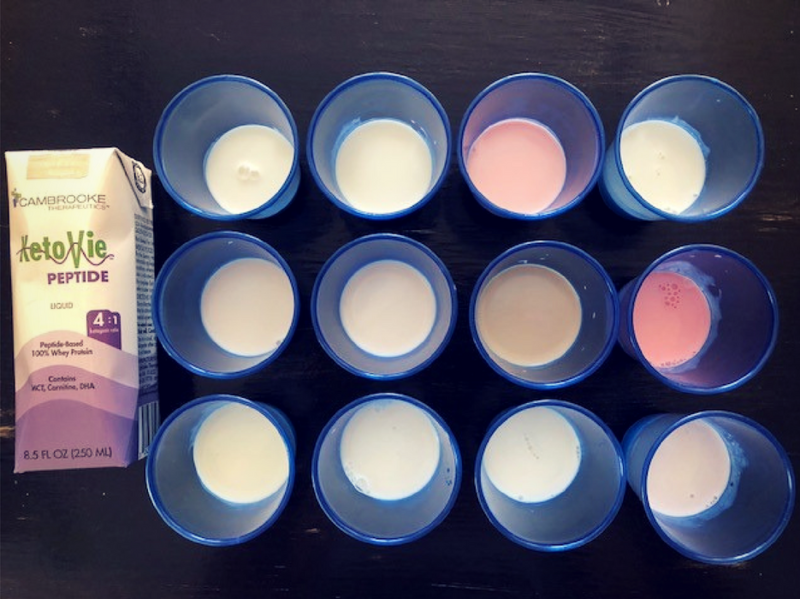 Our mission is to help all people who need ketogenic diet therapy, whether they need their nutrition supported by tube feeding, formula for digestive sensitivities, or when they can drink whole protein formula on their own. We’ve been told that children using Ketovie Peptide 4:1 are already showing seizure improvement and better digestive tolerance. Apart from the protein source, KetoVie Peptide 4:1 is similar to KetoVie 4:1 Vanilla and Chocolate. Each carton contains 6 grams of MCT oil to help boost ketosis and improve absorption of fats. Carnitine is added to help process and absorb the longer chain fats. A blend of soluble and insoluble fiber is added to help with digestive health, constipation or diarrhea, and calcium absorption. 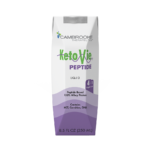 KetoVie Peptide 4:1 also has a special bone health blend of nutrients including increased calcium, phosphorus, magnesium, Vitamin D, Vitamin K1 and K2. And to round out the benefits, Ketovie Peptide 4:1 also contains selenium, to reduce the risk of selenium deficiency during a long-term ketogenic diet therapy. Ketovie Peptide was made with little flavoring — just a touch of stevia and natural vanilla. To jazz up KetoVie Peptide with more flavors, here are some low-carb options that are easy and tasty. Mio drops are also 0 g carbs per 1/2ml squeeze. Finally, for teens or adults who need a more “adult taste”, you can use decaf instant coffee by adding 1 tsp per 250ml, 1g carb / 1tsp. If you think KetoVie Peptide might help you or a loved one, contact your keto clinic today.